“But…but, Dave!” I hear you sputter. “The Iron Giant isn’t a monster!” Au contraire, mon frere. That’s my douchey way of saying that in the Halloween ecosystem, the Iron Giant fills the ecological niche of Misunderstood Monster. You know the type: too big for his own well-being, basically good-hearted until you cross him. The Iron Giant was a 1999 animated film directed by Brad Bird, better known for his Pixar productions: The Incredibles and Ratatouille. It told the familiar tale of boy meets giant robot, military shoots giant robot, giant robot proves his good intentions, dies anyway. While it’s since been recognized as a modern classic, it was a box-office flop. Fans like to believe that this was because Warner Bros. bungled its marketing, but I disagree. It was released at a time when Disney still completely dominated the animated feature film genre. It didn’t feature musical numbers, cute sidekicks or crowd-pleasing pop cultural references. Plus, it had a science-fiction theme; the animation field is littered with the bloated corpses of allegedly boy-friendly sci-fi adventures such as Treasure Planet, Atlantis: The Lost Empire and Titan A.E. Based loosely on a fantasy novel by Ted Hughes entitled The Iron Man, it was reconceptualized as a ’50s sci-fi pastiche. The Iron Giant fell to earth from outer space, clonking his noggin on impact. 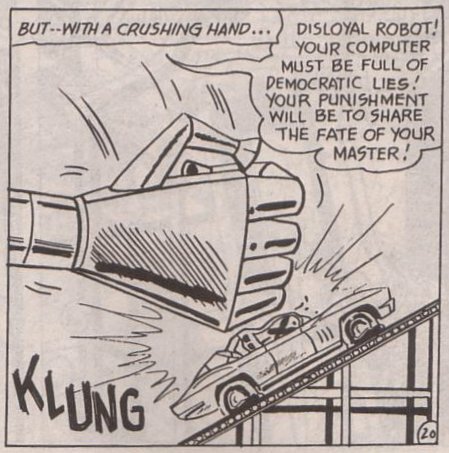 Unable to recall his purpose, he wound up befriending a young boy with the highly implausible name of “Hogarth.” The kid did his best to hide the huge robot from a paranoid U.S. government agent, and also to instill the mechanical man with an understanding that he had the ability to choose who he would become. 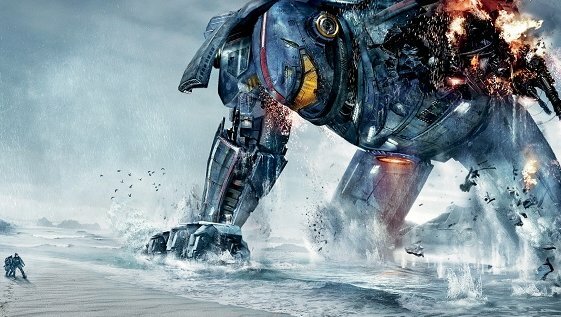 Naturally, it all went pear-shaped by the third act, with the Iron Giant revealed to a frightened military. What I find interesting is that while the film obviously sided with the monster, it also made clear that the government’s distrust wasn’t entirely unjustified. I suspect that without that little dent in his metal melon, the giant would’ve happily burned Hogarth to ashes and gone on to conquer the world. When Hogarth appeared dead, the Iron Giant shifted into offensive mode, and what a mode it was! Hey, nice arm cannon! What about the other one? Oh. Sweeeet! What else you got? Okay, that’s a little freaky. Kind of a War of the Worlds thing you got goin’ there. I’m not even sure what that spinny disc thing is. The redonkulous chestzooka might be overkill there, mate. Alright, don’t get mad. You’re a fine robot monster, you are. Now, of course, the Iron Giant was ultimately given the chance to prove he was not a gun. (Or rather, not just a gun. ‘Cause, looking at the above, I’d say he was pretty clearly one.) And if you can get past his “Superman” moment (you’ll know it when you see it) without fighting back tears, then I want nothing to do with you. 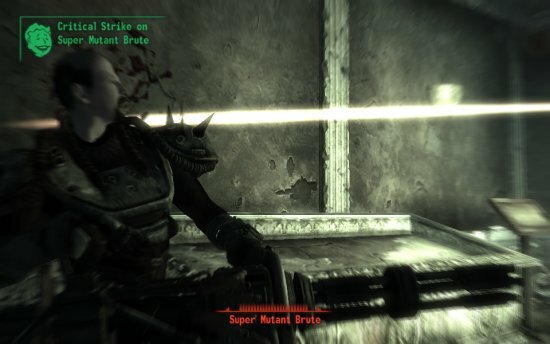 I spent much of my week off immersed in the world of Fallout 3. I’ve now witnessed my digital me die dozens of times. It’s still weird. Here are some random observations regarding my travels in the D.C. Wasteland. There’s no crippling injury that can’t be cured by an hour’s sleep. I applaud the game designers’ inclusion of restrooms in most of the houses and public spaces. For me, nothing breaks the verisimilitude of an imaginary environment more than the lack of a place to poop. Robby the Robot-style mechanoids are cool. Robby the Robot-style mechanoids in powdered wigs are awesome. I still hate Moira. But at least I’ve stopped trying to kill her. 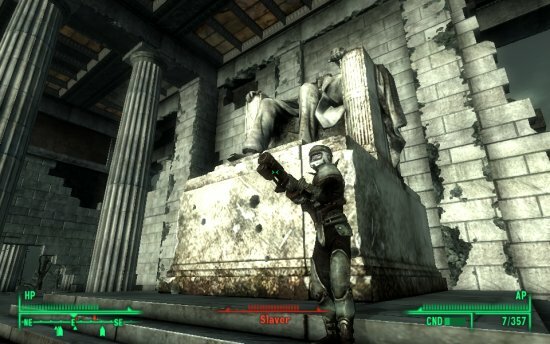 Killing slavers on the steps of the Lincoln Memorial is satisfying, but not as much as gunning down the head slaver with Lincoln’s own rifle. 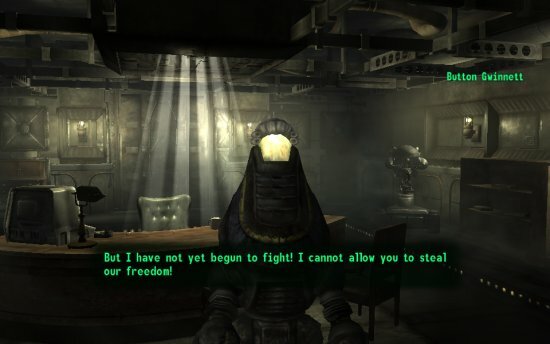 Apparently, making pretty much the same decisions that I would in real life makes me a saint in Falloutville. Being a saint means that you can steal stuff with impunity. Lincoln’s rifle is sweet. 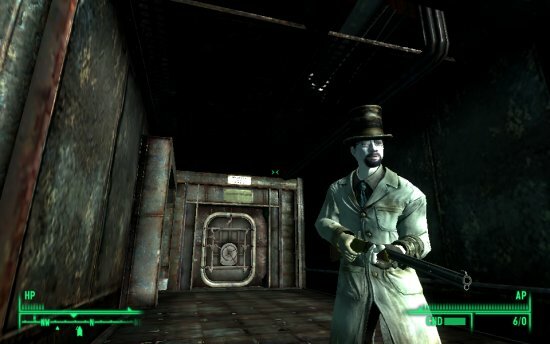 Lincoln’s hat? Priceless. 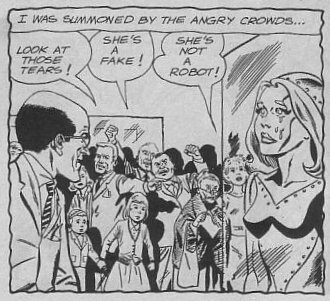 Who knew that Ann Coulter built a giant robot? 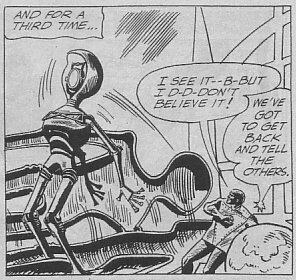 Panel from Metal Men #15, August 1965. In the ’60s, we got to the moon by flying through a PICTURE of the moon. While my love of so-called “Silver Age” (1956-69 or thereabouts) DC Comics remains unabated, I have to admit that in rediscovering them through the massive reprint volumes known as Showcase Presents I’ve found that all too often, they…well, let’s just say that they’re not quite as good as I remembered. Must be a Russian robot. The Showcase books, which reprint entire runs of comics in chronological order, aren’t necessarily the ideal format for these stories. Consuming issue after issue in one go rather than waiting a month or two for the next installment highlights their repetitive and formulaic nature. Submitted in support is the most recent volume, featuring the Metal Men. This unusual super-team debuted in 1962, in issue #37 of the original Showcase title. Showcase (no “Presents” back then) was a book which tried out new characters and concepts, with the most popular given their own titles. 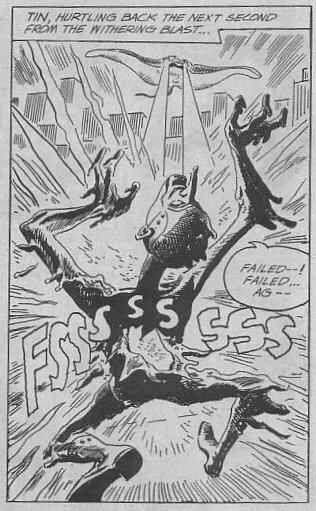 “Metal Men” was originally intended as a mere fill-in story, but the heroes were so well-received that they appeared in four issues before spinning off into a bimonthly series which ran for another seven years. 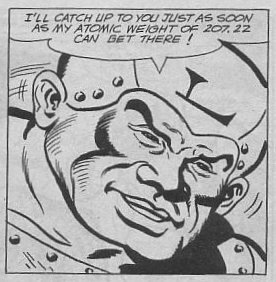 Lead became so concerned over his atomic weight that he developed an atomic eating disorder. The Metal Men were robots created by the brilliant Doc Magnus, each a shape-shifting humanoid endowed with the properties (and anthropomorphized personality) of a metallic element: noble Gold, strong man Iron, slow-moving Lead, hot-headed Mercury, weakling Tin, and beautiful Platinum, the latter the only female in the band. Look, I said it was the ’60s. It was established from the beginning that the effectiveness of the Metal Men as superheroes stemmed from their imperfections. The “responsometers” that governed their actions left them with human-like emotions, ironically making them better at their job than mere robots would have been. On several occasions, Doc built duplicate Metal Men without this flaw, and the dopplegangers inevitably proved a danger to others. Get used to this line of conversation. It’ll come up again. Mercury would arrogantly declare that he was the only metal that was liquid at room temperature. 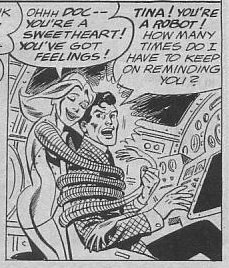 Doc would tell Tina that she was not a woman, and that she should behave like a robot. The Metal Men would announce their respective atomic weights and/or boiling points. 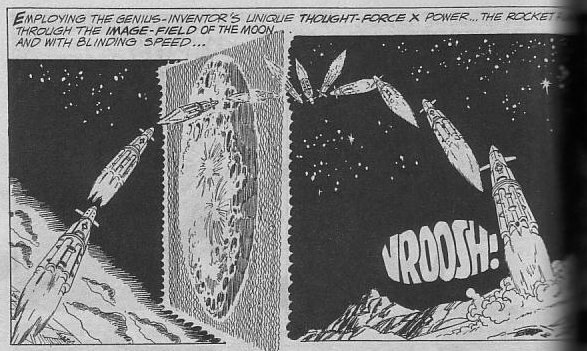 DC Comics were scientific like that. 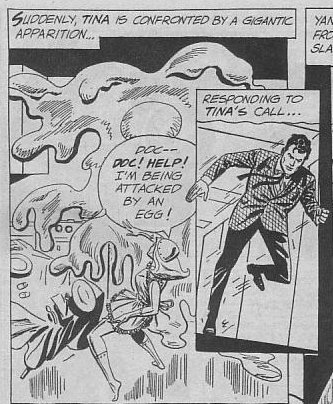 Tina would act like an unpredictable woman, forcing Doc to remind her that she was, in fact, not one. Did I mention that Tina was really a robot? And not a girl? Just another day at the office for Tin. The Doc and Tina relationship got pretty sick. Doc kept promising to ship her off to the Museum of Science (or, as I prefer, Museum of SCIENCE!!!). This he eventually did, but they sent her back because the patrons complained. Museum goers are a tough crowd. That’s because the Museum of SCIENCE!! !, when gifted with a metamorphic, self-aware work of unparalleled genius–which could stretch itself thinner than a human hair and was capable of pleasuring others in ways of which human women had never dreamed–could think of nothing better to do with it than to lock it in a glass coffin and demand it to stand very, very still. And they were dissatisfied when it began to mope. 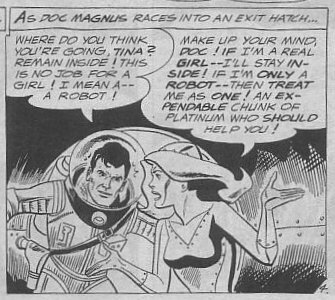 I know that rationality was not the order of the day here, but it occurred to me that if one was a scientist who had committed to donating one’s fabulous platinum robot to the Museum of SCIENCE!! !–and had, in a previous story, built a second model without those pesky human behavioral traits–one would really be an asshat to give them the crying one. That’s Doc Magnus, inventor and asshat. Only 37 more times. This issue.